All orders are shipped via UPS. UPS is able to guarantee the safe arrival of your glass bottles. Your privacy and security is important to us. We are a small family business. We too shop online and understand the importance of privacy. We collect only the information necessary to process your order and promise that this information will not be given or sold to 3rd party's for any reason. Our checkout process is handled by 'PayPal'. Chef Tim Foods doesn't ask for or store your credit card information. We also use your registration information to verify who you are when you submit recipes and reviews to our web site. This helps us keep 'bad' people from damaging our web site. And finally we do occasionally send out emails letting you know about sales, new locations and new products. We try very hard to keep this to a minimum. We don't like 'spam' either. If you would prefer never to get any emails from us, please tell us so on our contact form and we will remove you from this list. We take great pride in the quality of our products. However if you are unhappy with your product or find damaged due to packaging or shipping, please contact us via our web site's Contact page. If possible, please include your username and order number. Please use our online shopping to order your Vinaigrette & Seasonings. Our payment processing is secure. However, if you prefer to talk to a live person, we are happy to take your order over the telephone. For phone orders, please call Sabrena at: 717-802-1936. Yes, you can use any credit card. We use PayPal as our payment processing company. 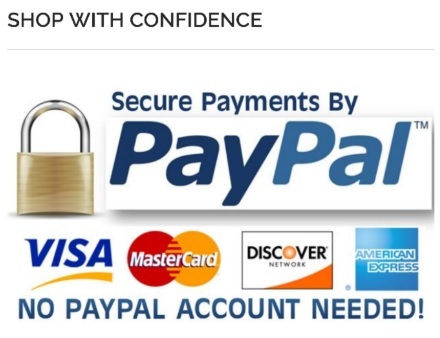 Many Pop-Up Blockers prevent PayPal from opening. (You may need to temporarily turn off your pop-up blocker to complete your order.) You do NOT NEED A PAYPAL ACCOUNT to purchase our Vinaigrette. Below the PayPal Log-on section is an area to Pay by Credit Card. To view your previous orders, logon to your account. In January, 2015 we migrated to a more secure and updated e-commerce program. Unfortuatnely, any accounts or orders made online prior to January 2015 are unavailable. As a security measure, the migration did not copy passwords. Please reset your password. If you don't get the reset email, please check your spam filters. Or, simply create a new account. If you are unable to successfully reset your password, eamil Sabrena at: cheftim@ptd.net or use the Contact Page. If you need to update any existing account information, please log onto your account. If you need additional assistance, please send us an inquiry through the Contact Us page.